Keep your color-treated hair vibrant with a new way to shampoo! This shampoo bar, with Amazonian Murumuru Butter, moisturizes for a healthy looking gloss. A fragrant kiss of nature and juicy freshness from the handpicked Bulgarian Rose Petal. This shampoo bar is also cruelty-free, paraben-free, silicone-free, sulfate-free, dye-free & formulated without phthalates. Life should be full of color. That's why our Blooming Color Shampoo Bar is designed to deliver a healthy shine while protecting colored hair. The formula is infused with organic murumuru butter that is sourced from a certified sustainable source in Brazil. Murumuru is a lot like coconut oil. Murumuru butter comes from the white fat found in the nuts of the Amazonian murumuru palm tree. That fat is known to be deeply moisturizing so it helps nourish, soften and protect. Also infused is ethically sourced rose absolute from Bulgaria. Our Blooming Color Shampoo Bar exudes a rich, warm floral rose experience. In this fragrance the natural vibrancy of the rose notes is enhanced by the juicy freshness of red berries delivering an intensely feminine and refreshing ambiance in your shower. • Simple! 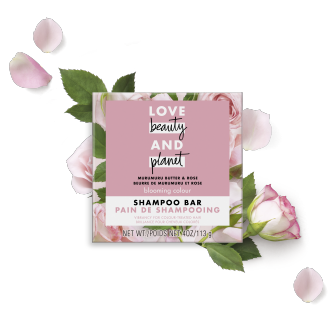 Rub the Love Beauty and Planet® Blooming Color Shampoo Bar between your hands for lather or directly onto hair. • Gently massage the scalp and roots with fingertips, and rinse thoroughly. Go easy on the tap. • Finish with Love Beauty and Planet® Blooming Color Conditioner, and style with your favorite products. Love Beauty and Planet® Blooming Color Shampoo Bar, infused with murumuru butter, softens and moisturizes hair. Experience our fragrance infused with Bulgarian rose absolute for a juicy kiss of nature with every wash.
Sourced from tall palm trees native to the Amazon basin, murumuru butter is made from fruit fat found in murumuru nuts, which fall from the trees and are harvested by locals, and is widely known to help retain moisture.